We present here the first Scottish Book of Common Prayer, as adopted in 1912. As noted below, this book is essentially the English 1662 BCP with the addition of the Scottish Communion Office, along with certain other relatively minor additions and perrmissible deviations. It was replaced by a more extensive revision in 1929. Prior to this time, the individual Scottish parishes would generally use the English 1662 BCP, along with the Scottish Communion Service, if desired. 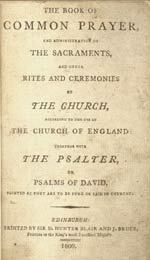 Books of Common Prayer printed in Scotland prior to this time were identical to those printed in England (see below). This text is also available from the Internet Archive in PDF and plain text formats. NOTE.—The portions of this book which are marked by a marginal line are permissible additions to and deviations from the Service Books of the Scottish Church as canonically sanctioned. 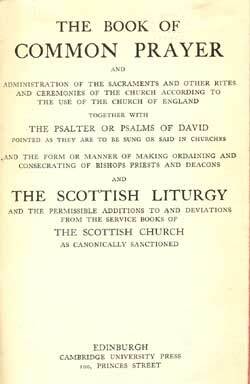 The Scottish Liturgy, and the additions and deviations, are copyright of the Episcopal Church in Scotland. "Service Books as canonically sanctioned" means, in other words, the English 1662 BCP, such as the one pictured above, printed in Edinburgh in 1809.